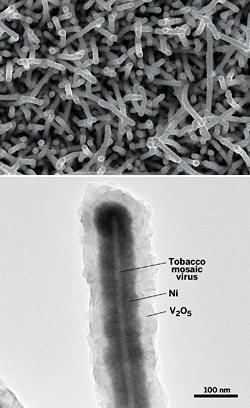 A microbattery cathode material prepared by depositing a composite of nickel and V2O5 as core and shell (dark inner and light outer regions) over a tobacco mosaic virus template. Top: SEM image; Bottom: TEM image. Photo credit: Ekaterina Pomerantseva, University of Maryland. ISR Director Reza Ghodssi (ECE/ISR), Maryland NanoCenter Director Gary Rubloff (MSE/ISR), Research Associate Ekaterina Pomerantseva, and Ph.D. student Konstantinos Gerasopoulos figure prominently in a Chemical & Engineering News story about advances in the use of the coating technology known as atomic layer deposition (ALD). ALD can produce thin films of exceptional quality and first was used in the semiconductor processing field. The technique has a growing commercial importance and is expanding rapidly into technology areas such as lighting and flexible displays, batteries, fuel cells, photovoltaics, textiles, biotechnology and biomedical devices, Chemical & Engineering News’s Mitch Jacoby reports. Rubloff was interviewed about ALD’s many new applications and the ALD conference he and Jill Becker, CEO of Cambridge NanoTech, organized this summer for the American Vacuum Society. Ghodssi, Pomerantseva and Gerasopoulos were mentioned for their research using ALD to coat Tobacco mosaic virus-based nanowires, resulting in novel biotemplated electrodes for tiny lithium-ion batteries.